Our BMMI Djibouti warehouse underwent a complete revamp recently and the team were working tirelessly to ensure it was a success. As part of the revamp, the Facilities Maintenance department set a comprehensive action plan in the month of June to prioritise tasks, setting a target of 180 days to complete it all. The mission was set! By strictly following the plan, and thanks to the dedicated team work and great efforts, the mission was accomplished. The team implemented best practices including maintenance Key Performance Indicator’s, a fleet management system with a GPS tracker, tool and spare part inventory management, as well as reparation and maintenance of machines including various trucks. 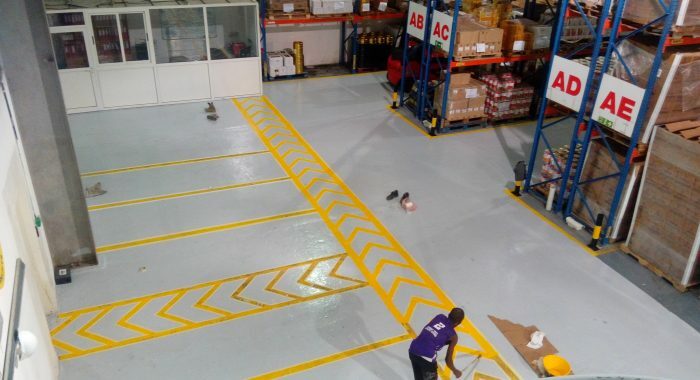 The big event was the warehouse floor reparation and Epoxy painting, which was successfully completed, with very limited time during the Eid Al Adha holidays. The team set up a day and night schedule to ensure this was completed on time. Luckily, the Maintenance and Warehouse department managed to schedule this project without any business hours lost. BMMI Djibouti and Sudan Country Manager, David Hanse expressed his gratitude and congratulated both the maintenance and warehouse teams. He is extremely proud and thankful that everyone involved was truly dedicated and have worked very hard during this time.